With all the fanfare and emphasis on protection-of-the-general-public that they could muster, the US Food and Drug Administration announced this week that they are activating new regulations on sunscreens. Somehow I doubt that the new labeling will do anything to reduce the increases in skin cancer that are being reported, (people still smoke despite the ever scarier labeling on the packs), and capping the limit for the sun-protection factor (SPF) at 50 is not really doing any good for anyone. 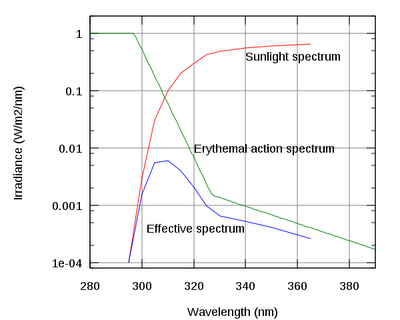 where MPF(l)is the monochromatic protection factor - how much the transmission at each wavelength. SPF is only calculated for the UVB spectra (280 nm - 315 nm), not UV A (315 nm - 400 nm). I imagine trying to patch together an activation spectra for UVA light would be challenging - not so much in preparing the spectra, but in trying to assess the relative impact of it compared to the SPF calculated for the UV B range. Bottles could be labeled with 2 SPF's, but that would be too confusing, wouldn't it? 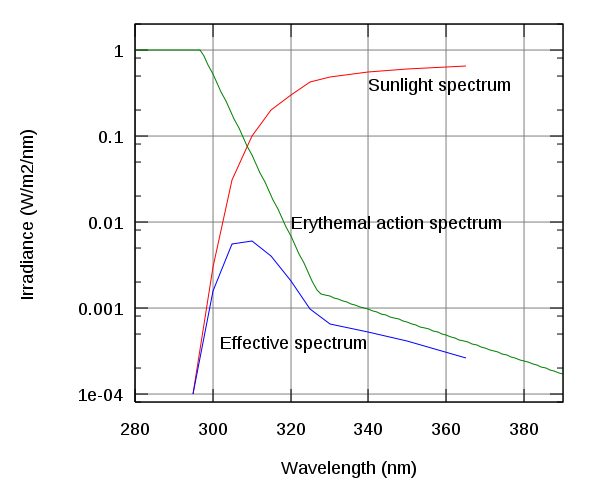 [*] The activation spectra of a reaction is a description of how the kinetics change with wavelength. This is an extremely important concept that is often overlooked in most UV exposure testing. Most people assume that exposing a sample to shorter wavelengths will be fine for mimicking degradation in the natural environment. That only works for materials that absorb at the lower wavelengths. Unabsorbed photons do not lead to degradation, so in some cases, exposure to the wrong wavelengths will lead to completely erroneous conclusions about how well a part will survive. Always know your activation spectra! Hey - I am certainly glad to find this. cool job!